I don't know how many frogs, toads or princes I have to kiss to break this curse of the crappy fortune cookies but this is getting ridiculous. I mean, what does a girl need to do to get some good fortune around here. Some legitimate good fortune. Do I have to eat a poisoned apple, fall into a coma and wait for a handsome yet melodic knight in shining armor to come rescue me? Honestly. What is with this run of bad luck and the crappy fortune cookies. Dave gets fortune cookies that say "people admire your social and physical appearance" and nothing bad happens to him. He doesn't grow a third arm, or break out in hives. NOTHING!!! Not that I am saying that I want anything bad to happen to him, but really...where is the fairness. The universe is out to get me!!! Well, maybe not the universe, but the fortune cookie guy or gal sure is. What is with the ranting you ask? Well, Dave convinces me that it is actually cheaper to go get Chinese food at the amazing place rather than go to the grocery store, so we go. Caiden and I get our usuals and share. At the end of the meal Dave asks me if I am going to eat my fortune cookie, or at least read it. (Dave doesn't like to eat fortune cookies, but he likes to read them. I like to eat and read them). I smiled and told him no. They're cursed. I didn't even touch mine for fear of absorbing the bad fortune. Dave takes my fortune cookie and says " Well, I'll open your fortune cookie then". He then starts laughing and holds the fortune to him. "What?" I say. He then shows me my fortune. 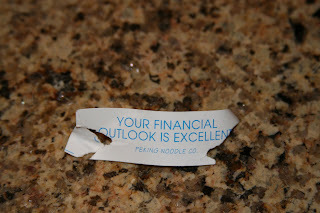 "Your Financial Outlook is excellent". Yea, right...of course it is. And to make matters worse it is all ripped and torn up. And that's the way it was in the cookie. Dave didn't break it!!! I'm cursed I tell you. Absolutely cursed. Well, since we are so strapped for cash, I asked Dave if I could buy a Starbucks - a treat for me. He says yes, and then proceeds to go on and on about what a waste of money it is. Now mind you, I RARELY buy something for myself, but whatever. I feel no sympathy, I told you to stay away from the cookies!! You didn't listen to me and look what happened...A WASTED Starbuck's!! Maybe if you hadn't forgotten the Starbucks you would have spilled it on yourself, sued Starbucks for millions and fulfilled your fortune, instead of being out 4 bucks? Guess we'll never know.